And the liberal media dreads her. Who is she? She’s Sarah Huckabee Sanders. In case you’ve been hiding under a freshly broken shard of glass from one of the ceilings being broken all over Washington D.C. lately - keep reading, it gets better. 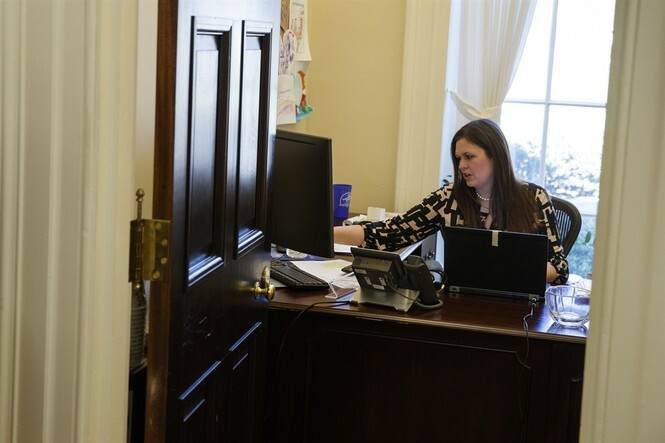 She’s the 3rd female to ever hold the office of the White House Press Secretary. And it’s no surprise that Trump put her there because she’s perfect for the job. In fact, Trump (who the feminist banshees claim “hates women”) has always put women in prominent roles. For example, I just read “The Art of the Deal” last year. But I digress. This isn’t about Trump, it’s about Sanders. She doesn't play their stupid game. Whose game? The progressive press of course. You know, the ones who literally worshipped Obama because of his skin pigmentation? Those ones. Instead of going down their asinine rabbit holes, she's simply there to represent President Trump. She's not there to answer stupid questions, spend needless time on idiotic games, or apologize for our President. For the first time in a long time, liberals are running for their safe spaces because the White House Press Secretary isn't their puppet. - And she doesn't back down for a second. SHE runs the show - not the progressive media. She’s not there to play games or make everyone happy. She’s in a word - savage (like the kids say it). A powerful competent woman who has proved over and over again that women can do some of the most demanding jobs on the planet. Feminists should be proud like they were when Kellyanne Conway became the first ever female to run a successful presidential campaign. Sarah Sanders is a “Boss," so why are the feminists silent? 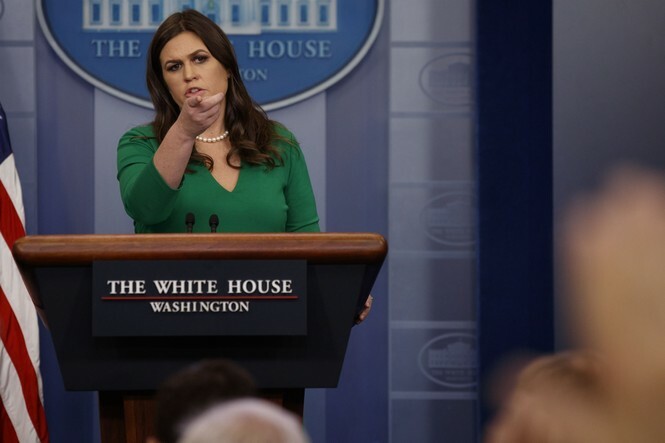 Sarah Sanders is an excellent example of female empowerment. But, where’s Beyonce? No concert for Sarah Sanders? Isn’t Sanders “slaying it” right now? I guess not because the fake third-wave chupacabras HATE her. I mean, these are only a few. They come out daily. I suppose you could scour Twitter to scrape the bottom of the feminist barrel (and it’s a deep, nasty, gross one) but those hate-filled, sexist, woman-hating tweets have no place here on Townhall.com. I don't even think feminists themselves would dispute that they hate Sanders. But she’s a woman who’s in a powerful political position, so - why? Here’s why: Because third wave feminists (a.k.a. the most anti-woman group on earth) only want progressive women to smash through glass ceilings. Then according to the feminists, that woman would be an Uncle Tom (or...Auntie Tom?)! But…when a President who recognizes that women have a real and legitimate place in the White House puts women in powerful roles…The banshees start shrieking! "The Patriarchy has foiled our plans...again!" "Now we can't vote, drive cars, run for President, start businesses, own homes, be CEOs, doctors, lawyers, entrepreneurs, join the military, teach, preach, run companies, or anything...wait...what are we fighting for again...?" But it’s okay. Not a lot of people really listen to them. In fact, according to a 2015 Vox poll, 82% of American women *DO NOT* call themselves feminists. Meaning that MOST women think feminism is irrelevant (because, well, it is). Third-wave feminism is ironically on a mission to destroy femininity. They actually want to demolish womanhood. So, we shouldn't expect the feminists to rally behind Sarah Huckabee Sanders anytime soon. Or...ever. Good thing Sarah isn’t interested in sucking up to the mere 18% of women who call themselves feminists (or the couple soy-latte drinking men who also joined the girl power club). Sanders has got a job to do - that's it. And she’s doing a damn good one at that. So, BRAVO Sarah. Even though Beyonce doesn't think so, I think you’re doing a fabulous job. ...is to be as savage as Sarah Huckabee Sanders.